MAJOR GENERAL CLICK D. SMITH JR. Retired June 1, 1985. Died January 12, 2004. Major General Click D. Smith Jr. was deputy director for strategic mobility, J-4, Organization of the Joint Chiefs of Staff, Washington, D.C. His responsibilities include planning and executing air, land and sea strategic movement of U.S. forces to contingencies anywhere in the world. He also conducted major mobility studies to examine the capabilities and determine requirements for strategic mobility issues, to include the capability of industry to field and support the force. General Smith was born in 1930, in Lumberton, North Carolina, and graduated in 1950 from Michigan State University with a bachelor of science degree in aeronautical engineering. He received a commission in the U.S. Air Force through the Reserve Officers' Training Corps program. The General earned master's degrees in management and international affairs from The George Washington University, Washington, D.C., while completing the Air Command and Staff College at Maxwell Air Force Base, Ala., in 1963, and the Naval War College, Newport, Rhode Island, in 1971, respectively. In November 1950 General Smith entered active duty as a student navigator at Ellington Air Force Base, Texas, and joined the 67th Tactical Reconnaissance Wing in South Korea immediately after graduation. He flew 55 combat missions in RB-26s during the Korean War. Upon his return to the United States, he served as a C-46 and C-119 troop carrier navigator at Atterbury Air Force Base, Ind., and Lawson Air Force Base, Georgia. After entering pilot training in June 1952, he completed primary training at Columbus Air Force Base, Miss., and was honor graduate of his advanced training class at Reese Air Force Base, Texas. He served as an RB-26, RB-57A and RB-66 aircraft commander and instructor pilot with the 363rd Tactical Reconnaissance Wing at Shaw Air Force Base, South Carolina, from November 1953 to June 1956. Upon graduation as an honor graduate in January 1957 from the Aerospace Research Pilot School at Edwards Air Force Base, California, he served as a test pilot with the Aeronautical Systems Division at Wright-Patterson Air Force Base, Ohio, until September 1962. While there he participated in a wide variety of multiengine jet aircraft research programs. These included setting a world endurance record for jet aircraft at 80 hours and 52 minutes in a B-47, penetrating thunderstorms in a B-66 during a stress analysis program and as project officer for RC-135s, flying strategic reconnaissance missions in the Arctic. General Smith then attended Air Command and Staff College and in July 1963 he was assigned to Kirtland Air Force Base, New Mexico, serving with the bomber and diagnostic branches of the 4900th Test Group. He later became chief of the Standardization Branch and conducted the flight test program for the Air Weather Service's WC-135 fleet. Following F-4 combat crew training at Davis-Monthan Air Force Base, Arizona, in 1968, General Smith served as operations officer for the 435th Tactical Fighter Squadron and subsequently as assistant deputy commander for operations of the 8th Tactical Fighter Wing at Ubon Royal Thai Air Force Base, Thailand. He flew 108 combat missions over North Vietnam and 47 combat missions over Laos and the Republic of Vietnam. Returning from Southeast Asia in 1969, he was assigned to Headquarters U.S. Air Force, Washington, D.C., as a staff officer in the Operations and Test Branch of the Directorate of Operations. Following graduation from the Naval War College in July 1971, he took command of the 58th Weather Reconnaissance Squadron at Kirtland Air Force Base. His squadron flew high altitude RB-57F missions around the world. General Smith moved to Norton Air Force Base, California, in September 1973 as vice commander of the C-141-equipped 63rd Military Airlift Wing. In August 1974 he transferred to Dover Air Force Base, Delaware, as vice commander of the C-5-equipped 436th Military Airlift Wing. General Smith took command of the wing in April 1975. From June 1978 to June 1980, General Smith was assigned as commander of the reactivated 322nd Airlift Division, Ramstein Air Base, Germany. The division maintains and controls the airlift capability of European-assigned Military Airlift Command resources and has command and control over transient Military Airlift Command aircraft operating in Europe, the Middle East, and Western Asia. During his tenure as commander, Airlift Forces Europe, the 322nd Airlift Division was responsible for the movement and return of an Inter-African Peacekeeping Force to Zaire, the voluntary movement and evacuation of Americans from Iran during that country's revolution, as well as a host of other unique accomplishments, including the first-ever landing of a C-130 Hercules on a German autobahn during Exercise REFORGER 78. In July 1980 General Smith become deputy director for operational requirements and deputy for general purpose forces, Office of the Deputy Chief of Staff, Research, Development and Acquisition, at Air Force headquarters. His responsibilities included all research and development programs for the tactical forces, air deliverable munitions, transport and trainer aircraft, and helicopters. He assumed his last duties in May 1981. The general is a command pilot with more than 18,000 flying hours in 68 different types and models of aircraft. He earned his Parachutist Badge from the U.S. Army's Basic Airborne School at Fort Lee, Virginia. His military decorations and awards include the Distinguished Service Medal (Air Force), Legion of Merit with oak leaf cluster, Distinguished Flying Cross with four oak leaf clusters, Air Medal with 16 oak leaf clusters, Air Force Commendation Medal with oak leaf cluster, Purple Heart, Presidential Unit Citation emblem with four oak leaf clusters, Air Force Outstanding Unit Award ribbon with "V" device and five oak leaf clusters, National Defense Service Medal with service star, Korean Service Medal with two service stars, Vietnam Service Medal with four service stars, Air Force Longevity Service Award Ribbon with five oak leaf clusters, Small Arms Expert Marksmanship Ribbon, Republic of Korea Presidential Unit Citation, Republic of Vietnam Gallantry Cross with palm, United Nations Service Medal and Republic of Vietnam Campaign Medal. He was promoted to major general June 1, 1981, with date of rank Sept. 1, 1977. 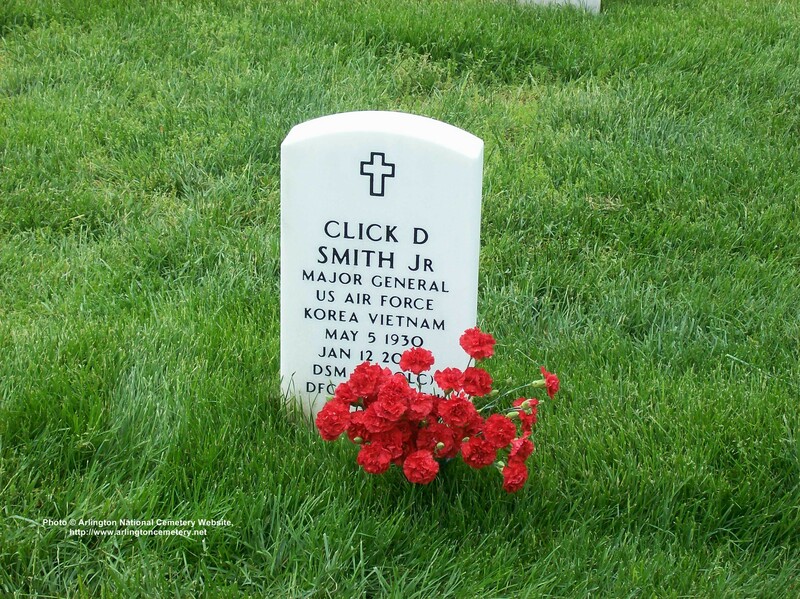 Click D. Smith, 73, a career Air Force Major General who in retirement flew medical charity flights, died of cancer January 12, 2004, at Walter Reed Army Medical Center. He was an Alexandria, Virginia, resident. Genaral Smith, who was born in Lumberton, North Carolina, received a bachelor's degree from Michigan State University in 1950 and joined the Air Force the next year. He flew 50 missions in Korea as a navigator and returned to the United States for pilot training. He graduated first in his class, then attended the Air Force test pilot school, where he again placed first in his class. He was assigned to Wright Patterson Air Force Base in 1956 and became an aircraft commander in a variety of fighters, bombers and cargo aircraft. General Smith flew 155 missions in Vietnam and was forced to eject once over Thailand. General Smith attended the Air Command and General Staff School while earning his master's degree in business administration from George Washington University in 1964. After a short Pentagon tour, General Smith attended the Naval War College and earned a master's degree in international affairs from GWU. He ended his military career at Dover Air Force Base, where he was wing commander flying C-5s. He also was deputy director for strategic mobility, responsible for planning and executing air, land and sea strategic movement of U.S. forces around the world. He retired from the military in 1982. His military awards included the Distinguished Service Medal, the Legion of Merit, the Distinguished Flying Cross, the Purple Heart and the Air Medal. In retirement, he studied for a degree from Capital Bible Seminary. He was elected to the McLean Bible Church's board of elders in 1987 and served as the church's chairman for 10 years, helping the church acquire property in Vienna to accommodate more than 3,000 worshippers. General Smith also was Chairman and Chief Pilot of Mercy Medical Airlift, an organization dedicated to providing air transportation without charge for patients and families. He flew 10,000 hours for the organization. Survivors include his wife, Iris Smith of Alexandria; a son, David Smith of Arlington; a daughter, Debbie Szabo of Fairfax; and two grandchildren. 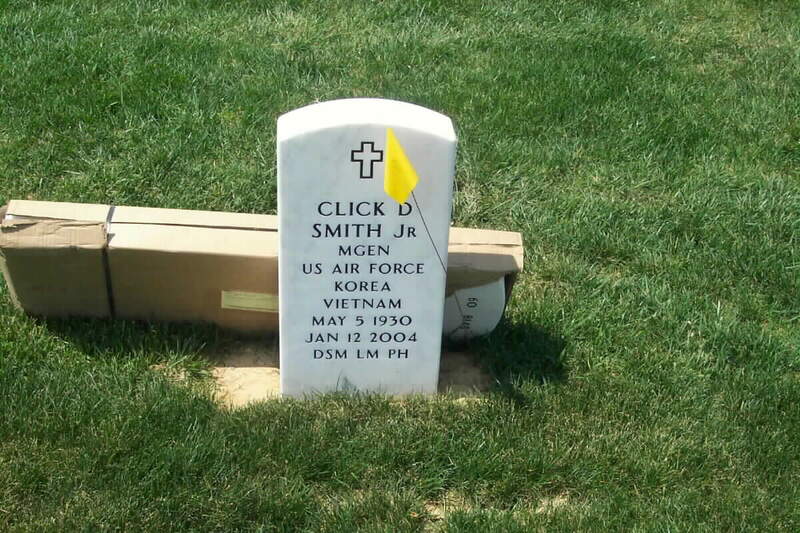 Age 73, of Alexandria, Virginia, died Monday, January 12, 2004 at Walter Reed Army Medical Center. He is survived by wife, Iris; daughter, Debbie Szabo; son, David Smith and two grandchildren. General Smith retired from J-4, organization of the Join Chiefs of Staff, Washington, DC in 1985. He was a consultant for Logistics Management Institute from 1985 until his death. Services will be at McLean Bible Church on Wednesday, February 11 at 10:30 a.m., followed by burial at Arlington National Cemetery at 3 p.m. Memorial contributions may be made to Mercy Medical Airlife, 4620 Haygood Rd., Suite 1, Virginia Beach, VA 23455 or McLean Bible Church Building for Life, PO Box 9300, McLean, VA 22101.